With third-quarter earnings largely in the books, this chart provides some long-term perspective to the current earnings environment by focusing on 12-month S&P 500 earnings. With third-quarter earnings largely in the books (over 78% of S&P 500 corporations have reported), today’s chart provides some long-term perspective to the current earnings environment by focusing on 12-month, as reported S&P 500 earnings. Today’s chart illustrates how earnings declined over 92% from its Q3 2007 peak to Q1 2009 low which brought inflation-adjusted earnings to near Great Depression lows. 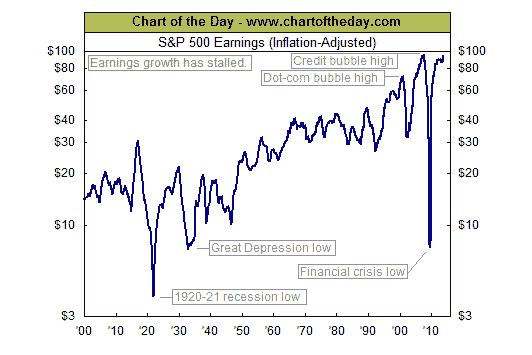 Since its Q1 2009 low, S&P 500 earnings have surged to a level that was not that far below its credit bubble peak. After the surge ended in Q4 2011, inflation-adjusted earnings stagnated. Over the past two quarters, however, corporate earnings have picked up significantly enough to where inflation-adjusted S&P 500 earnings are now beginning to challenge all-time record highs.